So maybe they’re not “world famous” but they sure were a big hit at our house this past weekend. We don’t eat burgers often so when we do we try to come up with something just a little different. 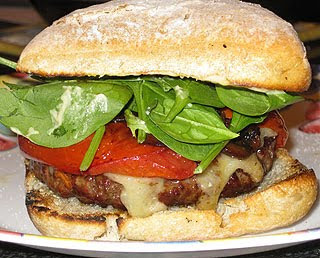 Click here and here to see two of our past burger ideas. Normally we’d come up with these recipes together but this one my husband came up with on his own. He’s very proud of it, which he should be, because it was delicious. He made fresh grass fed beef patties and grilled them on our outdoor grill. Each burger was topped with melted cheddar cheese and fresh baby spinach. There were also some crimini mushrooms that had been sautéed in equal parts butter and oil and oven roasted tomatoes slightly sweetened with sugar. All of this delicious goodness was piled onto a toasted focaccia roll spread with homemade garlic mayo. I'm not a fan of bought burgers, but kudos to your husband - I wouldn't let his one get away! That burger looks monstrous! And by monstrous I mean large and delicious. The way a burger should be. Love the toppings! That looks incredibly delicious! I haven't had a burger in ages! I love using spinach or other greens like arugula on my burgers as well. We will forget the fact that it is really good for us too and just concetrate on the wonderful flavours!! The burger looks great, but I think the best part is the focaccia roll. Yum.